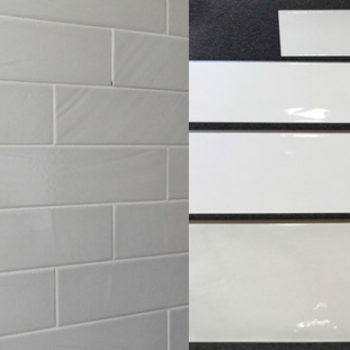 With so many different versions and sizes of a subway tile available (not to mention colour), it’s no wonder so many people get confused when they get to this stage of the selection process. Whether it’s for bathrooms, laundries, kitchens, outdoor bbq areas, the classic yet contemporary subway has been around forever. • What is the total size of the area I’m tiling? Proportions are really important in design, usually just as important as the products themselves. Take into account whether you have overhead cupboards in a kitchen, or whether or not you want to tile to the ceiling in a bathroom or laundry. • Are there any other stand-out features, artworks, or items of particular interest that I want to enhance or not take away from? Many times we see customers come in with an idea of a ‘standard’ subway size (for example, 200x100mm or ‘brick’), only to leave with a completely different size for their project. This is because if you have chosen, say, a large round statement mirror for your bathroom, you don’t want to draw away from it with a small, handmade-edged subway tile – which should really be a feature in itself. As always, if in doubt, or you’ve narrowed it down to 2 and are stuck on a decision, don’t go for the cheaper one or the easiest one. In the end, you’ve got to go with what you love – no matter what the current trends!